It turns out that I have so much to say about how to get a good night’s sleep, that I have to write this article in two parts. 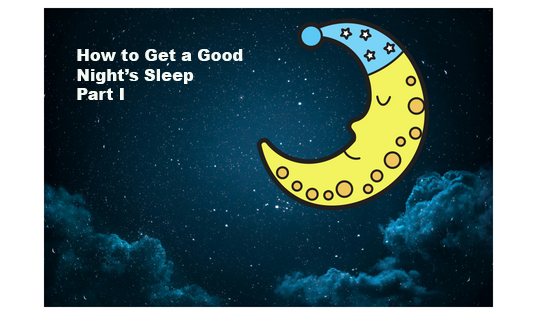 Part I has tips for what to do before you go to bed and how to choose a mattress and pillow, and Part II has tips for what to do when you find yourself laying awake in the middle of the night. I’ve also recorded a guided relaxation to help you relax and fall asleep. Keep the TV, office work, computers, and other electronics out of your bedroom. Turn off the electronics at least an hour before you want to go to sleep. Keep your room cool. Most people sleep best at temperatures between 65 – 69° Fahrenheit or 18 – 20° Celsius. Don’t drink too much alcohol or eat a big meal close to bed time. Have a nightly ritual that sends a signal to your mind and body that it’s time to wind down. This could be washing your face or taking a warm bath and changing into your bedclothes, curling up with a book and a cup of Sleepy Time tea, lowering the lights, and/or anything else that you find relaxing as long as it doesn’t involve video games or computer screens. If you take magnesium supplements, take them at night since magnesium can help you sleep better. If light wakes you up, buy black-out curtains (they come in a lot of different colors) and wear a sleep mask. I like this sleep mask because it has room for your eyes to blink and move. It is a must for travel. If noise keeps you awake, consider earplugs (I prefer the silicone kind) or a white noise machine. There are even free white noise apps you can download for your phone. I use White Noise by TMSoft when traveling or whenever the 6:00 a.m. traffic gets too loud outside my window. It offers several relaxing sounds in addition to sounds that seem like odd choices: train, plane, crowded room, hair dryer. Personally, I’m a fan of “brown noise.” And like I said, it’s free! The white noise needs to be loud enough to cancel out the sound you don’t want to hear but not so loud that it keeps you awake. To quiet your mind, try meditating right before you get into bed. Keep a note pad and pen next to your bed if you’re prone to waking up with ideas that you don’t want to forget. Once you write it down, you can let it go and get back to sleep. Don’t type it into your phone or computer! Don’t go to bed until you’re tired. Make sure your bed and pillows are comfortable. You have to be like Goldilocks and find the one that’s just right. You will spend eight hours a day on this mattress, so it needs to be great. A mattress is a big, important investment, and a good mattress is worth the expense. You will probably have this mattress for ten years or more, so if you divide the cost over a ten-year period, it’s really not so expensive. If you have a Sleepy’s nearby, they have a machine that calculates your pressure points when you lay down, so they can recommend the proper level of firmness. For couples, they combine the pressure points to find the best compromise. My favorite mattresses are Kingsdown and Simmons Beautyrest Classic, but mattress companies seem to use different labels for different stores, so comparison shopping is difficult. One thing that did not work for us at all was a Sleep Number bed. I know a lot of people love those, but it was a huge waste of money for us. It felt good for the minute we tested it in the store, but it’s basically an air mattress full of hard plastic parts, and we had to get rid of it just a few weeks after buying it. Spend a good amount of time testing the mattress in a store. Don’t be shy — you can’t tell in just a few minutes if it’s going to work for you or not. I don’t recommend ordering a bed online unless you’ve been able to test it. Your pillow needs to support your neck. 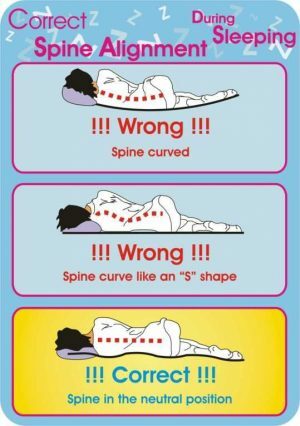 Your head needs to be able to sink into the pillow a little so your cervical spine can be straight and supported. If you sleep on your side and have broad shoulders, you’ll need more pillow under your neck than someone who sleeps on their back or doesn’t have that much empty space to fill. This brings me to the “no pillow” club. Some people profess that not using a pillow at all is the best option, but in my opinion, there are very few people with the anatomy for that. If you lay on your back without a pillow and your chin lifts toward the ceiling, you need support. 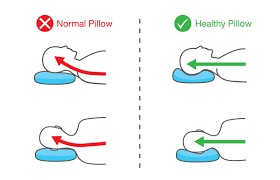 If you lay on your side and your head, neck, and shoulders are scrunched and your neck is not straight like the green side in the diagram above, you need a pillow. You might want to have some small support pillows on hand. Many side sleepers get a collapsed chest and rounded shoulders. Resting your top arm on a small pillow will keep your chest open and your shoulder aligned. You’ll breathe better and have less shoulder pain. Side sleepers who get hip or back pain might find relief from putting a small pillow between the knees, which will keep the top knee level with the hip. See, you even have to do yoga when you sleep! Try these tips, and if you have any of your own, please share in the comments section. Be sure to check out Part II for some interesting yoga advice on what to do if you find yourself wide awake in the middle of the night, and listen to the guided relaxation once you’re in bed and ready to go to sleep . Great tips, Sandy. Thank you.